Seattle’s musical history is insane. No lie, it’s incredible. Think Nirvana, Pearl Jam and the inimitable Jimi Hendrix. It’s been a while since I really smashed it in the new vinyl department but if I’m going to bankrupt myself anywhere, this felt like the right place to do it. And, oh boy, my current hermit status is so massively worth it for such handsome wax. Read on to find out where I spent all my pennies. Staying anywhere but in West Seattle means a ferry + a free shuttle bus + a short walk is the only way to reach Easy Street. An eclectic spot to hang out, I left with way more than I bargained for: Ryan Adams “Gold”, a belly full of Sound Garden Burger, & a legit damn fine cup o’ Joe. All enjoyed amongst the bustle and chatter of the record shop around me. Art & merch from local legends of all mediums welcome you into the store, head upstairs to find rows & rows of impeccably organised music on vinyl. 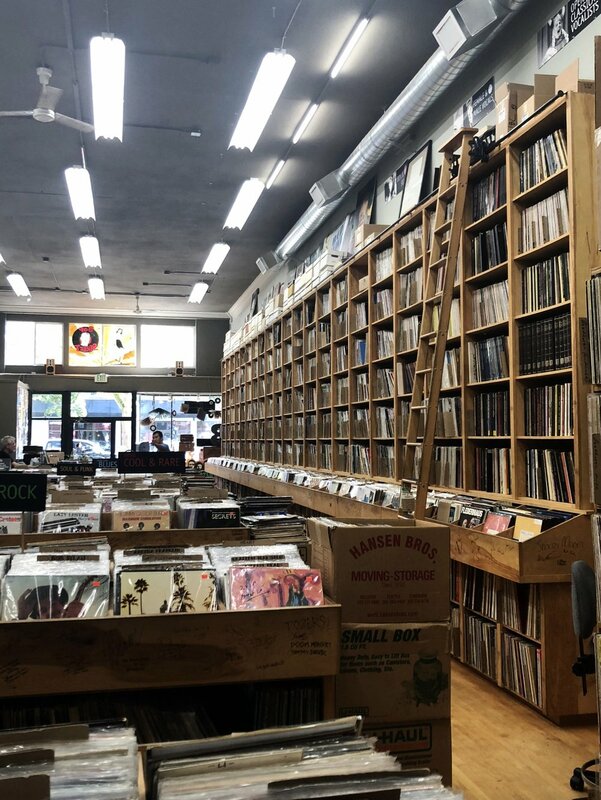 I found Easy Street different to a lot of other record stores & it’s a facet I loved because everyone who works there is incredibly friendly & approachable - something I learned very quickly not to take for granted in Seattle. Porchlight came highly recommended & as soon as I rocked up outside I felt very at home. Minimalism with a mid-century edge creates a calm & modern space, a blank canvas for thoughts to wander & seedling ideas to grow. Take your time mulling over life & Electric Dreams before browsing commences. Although a small section is physically dedicated to vinyl, the influence of local talent permeates in every crevice & crate. Oh, and Zac serves up coffee as rich & warm as his conversation. You have to visit Porchlight. Flamingo pin - I just had to have it & he’s since been named Andrew. Porchlight Mug - this beast holds a massive brew! See more of the States with me. Click here & let’s fly! Often frequented by Radiohead’s Thom Yorke, Bop Street is rated as one of the top 5 music shops in the whole of the United States of America by Wall Street Journal. Boasting a 500,000 title strong catalogue, it’s not tough to see why so many love this vintage vinyl haven, spending hours perusing through the insane library collected by the one & only Dave Voorhees. To me, Dave feels like one of the last remaining greats. A true advocate for & enthusiast of the joys of the physical format. Top tip: enter Bop Street with no strict timeframe, you’ll be in there a long time. Another Ballard staple is the shiny Sonic Boom Records. You’ll spot the massive rocket just up the road from Bop Street, and Sonic Boom is certainly more modern in it’s layout & catalogue than it’s neighbour but with that comes the modern attitude: helpful if not slightly aloof, such is the Seattle Freeze. Plus side of this, no need to stress about taking your headphones out. Chilly welcome aside, the neat, logical layout meant I still managed to get exactly what I wanted - would’ve been more if I hadn’t already metaphorically bankrupted myself elsewhere around the city. Slightly buzzed & totally spent up after a trip to the city’s best darn record shops? Fret not, for Seattle Tacoma Airport has your back (or not depending on how you look at it) with a standalone Sub Pop shop. They’ve got merch, they’ve got art, they’ve got books, pins, chocolate, gifts and yes, they have records. Sub Pop SEA-TAC also has cute & friendly people ready to have a chat & help you out. Although I didn’t pick up a record here, because I physically couldn’t carry any more, the bits I did get brought me joy. Sub Pop “Loser” T-Shirt in black (yes, I have two). Classic & Rainbow Sub Pop stickers (these were a gift because, as I mentioned, the people working there are cute and have great chat).